These days, we hear a lot about Left-wing and Right-wing politics, especially with the rise of extremists on both sides. Historically, the Left and Right were a simpler part of governance, but through the years we have altered the meaning and actually made the ‘sides’ unrecognizable. Originally, the meaning started around the time of the French Revolution with the French National Assembly. The French National Assembly was a group of aristocrats and well-to-dos who would make legislation, or laws, for the country. The congressional floor, where those legislators got together to make the laws, was surrounded by a semi-circle and members of the legislative body would sit on either the left or the right ‘wing’ of this semi-circle. Those who sat on the left of the parliamentary president supported a more secular government and the revolution in general. Those who sat on the right supported the old ways of the monarchy, or the Ancién Regime. Nowadays, the Left and Right imply greater political ideologies, practices and identities. When someone thinks of a Right-wing politician, one has an idea already programmed into the brain of what he or she would look like, sound like, and their beliefs. And vice versa. Most people are aware of what happened during the French Revolution. Things escalated quite violently as royals and the old ways were sent to ‘Madame Guillotine’. The general public were tired of the decadence of the rich, especially encapsulated with Marie-Antoinette’s infamous paraphrase ‘let them eat cake’, although some historians say she never said that. However, the anger around the supposed sentence was symbolic for the times. The common people felt like a more secular government would look out for their own interests and therefore, supported the Left-wing of government. Those who had money and titles for generations tended to favour the Old Regime because it kept their valuables, like property and riches, intact. That’s why they favoured the Right-wing of the floor. The basis of the ideologies spill over into today’s politics. The Left tends to be favoured by those who believe that social equality is more important, and the Right is favoured by those who believe in the equality of the individual. The current ideologies have even cemented new terms, particularly Socialism on the Left and Capitalism on the Right. Socialists tend to favour programs set up for everyone to enjoy, like healthcare and education. They see these things as human rights and something that evades them due to the hoarding of funds from those in a higher socioeconomic position. Capitalists believe that every woman or man be given an equal opportunity at achieving her or his best. They tend to believe that government has no right to guide the economy nor to create laws that affect an individual’s right to liberty, happiness, and all those other fundamental pursuits. Those who can make a fortune for themselves should be given the chance to do so. The problem with both of these ideals is that the philosophy of equality doesn’t necessarily apply to humans and our biology. However, that’s another topic altogether. What has happened, with the rise of democracy and the right to vote, is that both sides have gained popularity for various reasons. There are many who come from affluent backgrounds who now support the Left and those who don’t have as much who support the Right. The reason could be that the Left now appeals to a sense of moral justice, or the sense that human equality can be restored. The Right now appeals to the idea of an economic justice, or the idea that economic opportunity can be restored. At the end of an election, the winning party would be the one that turns out the most voters for whatever cause it appeals to whether moral or economic. A little different from the days of the Left-wing and Right-wing of the French National Assembly. There is no doubt that the world has seen a rise in populist parties. When we think of a populist party, we typically assume it’s one that leans hard to the “Right”, or what we think of as the Right-wing. However, populism got its start in the late-1800s as the People’s Party, a quasi-Leftist organization of agrarians from the southern U.S. that felt its interests were not met by Democrats or Republicans. Nowadays, we see a surge of populism from the Right, like Donald Trump, but we can’t forget those on the Left, as some have suggested the late Hugo Chavez in Venezuela. Essentially, whether on the Left or Right, a populist movement is a group of people who are anti-elite, anti-establishment and ‘of the people’. The movement is usually fuelled by a general interest and it is usually against the perceived corruption of whatever group is currently in power. Not only are there more populist movements, but they are winning federal elections. An article written for BBC hypothesizes that it could be the mistrust of established institutions since the global Great Recession of 2008. Economies all over the world were shaken and have been trying to rebuild for the past decade. Government officials seemed to step in. The instance that comes to mind is in the United States for the auto industry. The government attempted to save the big businesses by providing billions of dollars in bailouts. After the bailouts, many people remained unemployed, hungry, angry at and mistrustful of big business and government. Because of this, people began to vote for people who weren’t part of, what they call, the liberal elite. It wasn’t an outward revolt, but the frustrations towards the ‘haves’ echoed that of previous revolutionary movements. To the general public, the liberal elite are stereotypically those who are privileged to go to an Ivy-League school, work their way up the golden ladder and live off of the everyday person’s tax dollars. Essentially, at the end of the bailouts post-Great Recession, people felt cheated out of an economic opportunity. Ever since 2008, there’s been a lot of name-calling between sides: snowflakes, white supremacists, racists, elites, socialists and so on. This has fuelled a divide and polarized the current political climate, meaning the Right- and Left-wing have become somewhat extreme versions of what they originally stood for. Today, Right-wing seems to stand for economic advancement, Capitalism, stricter migration, embracing traditional values and nostalgia for the golden years of the past. 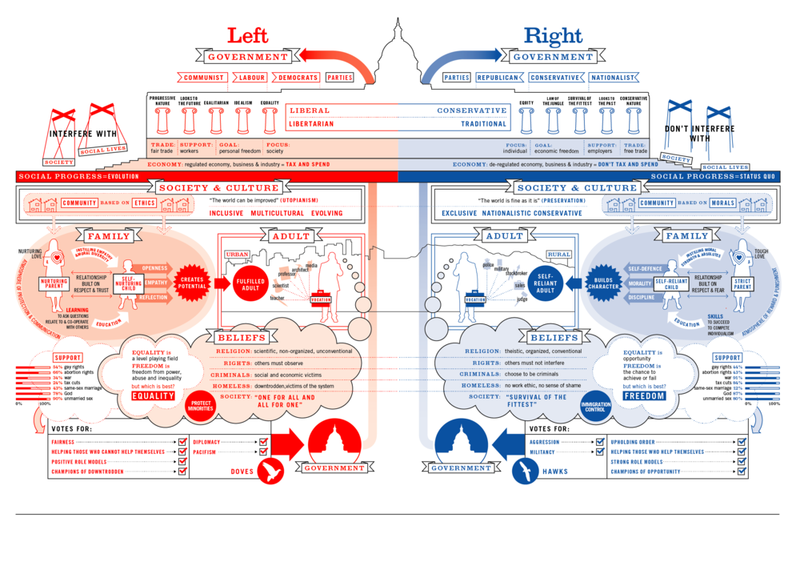 Left-wing seems to stand for social programs, Socialism, migration, progressive outlooks and the hope for what could be. Between either ends of the spectrum are more moderate beliefs and even those who dance from one side to the other. At the same time, each end has its own extremists. Contemporary politics are messy and the chaos is amplified with the use of social media. Trying to navigate what is Right or Left and what we believe ourselves has been difficult. Viral clips of political clashes spread like wildfire, the truth unfolds in ways we haven’t seen before, and both sides are constantly reacting to each other. At times, we begin to question what we believe about the sides we have already chosen. Whether you support the Right or the Left, the most important thing to take away is your power as a political individual. We might not live in the highest functioning democracy, but we still have a voice and a vote and used together that can be very powerful.